From Norton, Virginia, Jason Bailey is a composer/arranger for concert band, jazz band, and marching band. A 2006 graduate from East Tennessee State University in Johnson City, Tennessee, Jason has worked for five years in public education. He is currently a freelance composer and arranger, recently arranging music for the Unicoi County High School Marching Band in Erwin, Tennessee. Jason loves jazz, movie film scores, folk, and local music. He is currently a member of the UVA-Wise Highland Winds, UVA-Wise Jazz Bands, and Winds of the Mountain Empire. 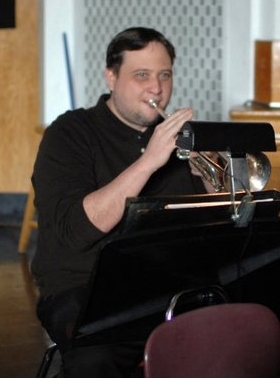 Jason has also been a soloist on trumpet for the UVA-Wise Jazz Band, ETSU Jazz Band, and Milligan Jazz bands. You can find Jason Bailey's music here.